Enter Virtualbox. It’s a piece of software that allows you to run a virtual computer ‘guest’ inside your standard computer ‘host’. I’ve used it before to have a separate windows installation for games and development, but I recently found out it was possible to run mac OS X too. It’s almost impossible to run OS X on anything other than official apple hardware, but it turns out the ‘guest’ machines created by virtualbox can be tweaked and are much easier to get OS X running. By the way you should know that this is not really in line with Apple’s T&C’s…. 1. Download virtualbox (I’m using version 5.1) and install it, along with Winrar or 7zip and some torrent downloading software if you don’t have those already. Click next, select 4GB of RAM, and next again. Select the El Capitan image that you have downloaded and unzipped as the disk image, and create the machine. Back in the virtualbox manager, select your virtual machine and click edit. In System>Motherboard, ensure that EFI is Enabled, Floppy id Disabled, Chipset is PIIX3. In System>Processor, select two CPUs. VBoxManage setextradata "El Capitan" "VBoxInternal/Devices/efi/0/Config/DmiSystemProduct" "iMac11,3"
VBoxManage setextradata "El Capitan" "VBoxInternal/Devices/efi/0/Config/DmiSystemVersion" "1.0"
VBoxManage setextradata "El Capitan" "VBoxInternal/Devices/efi/0/Config/DmiBoardProduct" "Iloveapple"
VBoxManage setextradata "El Capitan" "VBoxInternal/Devices/smc/0/Config/DeviceKey" "ourhardworkbythesewordsguardedpleasedontsteal(c)AppleComputerInc"
You can leave the command line window open. 5. Boot the virtual machine, and complete the setup for location and keyboard but DO NOT sign in with an Apple ID because it will not work until we have completed some steps below. 6. Open safari, search for and download a program called Chameleon Wizard. You will probably need to change the system settings to allow non-app store programs to run. Open Chameleon Wizard and click on the SMbios tab. Click Edit, and then select one of the pre-made SMbioses. Choose the type of mac you want (doesn’t really matter what, but best to resemble the virtual machine you’ve create I reckon), choose a manufacturing location and randomise the week of manufacture. It will generate spoof identification for the virtual machine. Copy down the Product Name; Board Product; and Serial and shutdown the virtua lmachine. 7. In windows, in the command line windows, enter the following commands, replacing the 3 items of information you just copied down. VBoxManage setextradata "El Capitan" "VBoxInternal/Devices/efi/0/Config/DmiSystemProduct" ""
VBoxManage setextradata "El Capitan" "VBoxInternal/Devices/efi/0/Config/DmiSystemSerial" "string:"
VBoxManage setextradata "El Capitan" "VBoxInternal/Devices/efi/0/Config/DmiBoardProduct" ""
9. 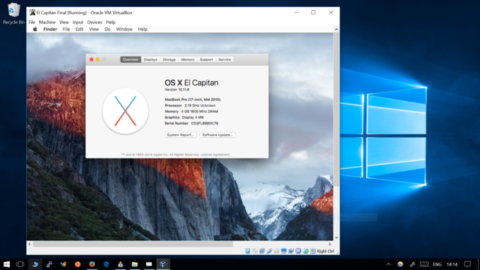 You can now boot the virtual machine, and will be able to log into it with an Apple ID. If you don’t have one, just google Apple ID and you can create one on the Apple website. You can then log into the App Store and will be able to download apps and update as per a standard installation.